We believe in the products we sell and in post-sales support. That is why even though we don't do any repairs on site we are here to assist you. Please contact your local Don's Photo for further information. If the product you've purchased needs repairs and it's under warranty we will be happy to take care of that for you at no charge. We will look after the package and the cost of shipping it to the authorized repair center. We will also track the repair and keep you informed of its progress. If the item is outside of the manufacturer warranty and needs some service we can take care of it. We will ship the item to an authorized service depot and get you an estimate on how much it will cost to repair. We charge and upfront non-refundable repest fee of $50. If the estimate we get is approved, then that fee will go to the cost of the repair. What if I didn't buy my camera from Don's Photo? - That's no problem we can still take care of it for you. We charge small shipping and handling fee and we will we will need a copy of the bill of sale. How long does it take to get it repaired? - It all depends on the work and if parts are required. Most repairs warranty or not will take on average 6-8 weeks. Don's Photo cannot guarantee how long a repair will take, however we will do whatever we can to get the repaired item back to you as soon as possible. Can I ask for Rush service? - Unfortunately due to the possibility of part shortages and other circumstances rush service on a repair is not possible. 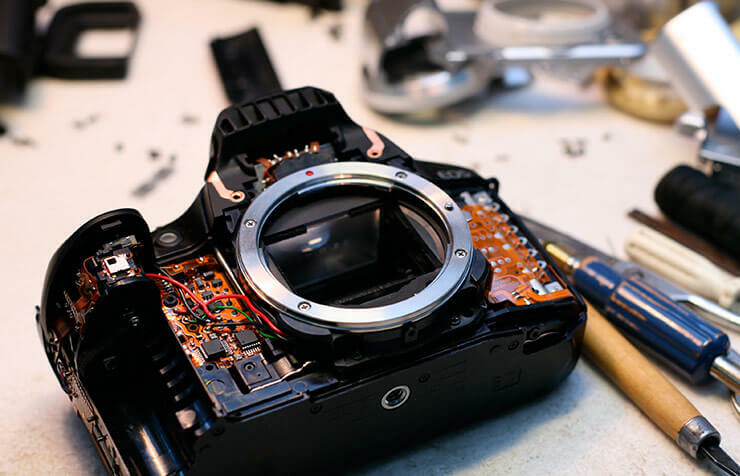 How much does it cost for a warranty repair? - There is no charge if the item was purchased at Don's Photo. If the item was bought somewhere else then we would charge a small shipping and handling fee. How much does a non-warranty repair cost? - It all depends what's wrong, but don't worry we will make sure to get you an estimate first. Do you provide a loaner? - If you purchased our ESP plan with loaner then yes we be happy to provide you a loaner while you equipment is getting serviced. Where do I drop of my camera? - You can bring in your camera to any Don's Photo location.